Who Is Responsible for Appraisers' Payments? Planet of Deadbeat AMCs! Mark Skapinetz is a Real Estate Appraiser in Marietta GA with extensive knowledge in Residential Appraising. He is the Head GA rep for the American Guild of Appraisers (AGA). Featured on Podcast such as Voice of Appraisal with Phil Crawford and The Appraisal Coach Dustin Harris as well as published interviews in Valuation Review. He is the creator of the 100% Real Estate Appraiser Group, The People's Appraisal Blog and co-creator of AppraiserFest. We begin here. Another story of an Appraisal Management Company going out of business, owing tons of money to appraisers for services they provided. Coester VMS, once one of the biggest players in the game, closed its doors recently. They closed them leaving appraisers with thousands of unpaid invoices for services that who knows if they will ever be paid for. As stated in previous blog posts, these AMCs are acting as agents of the lenders that choose to use them. The lenders sign contracts with the AMCs to provide a service to them in order to help keep Appraiser Independence as stated in Dodd Frank legislation. So who is really responsible for payments to appraisers? The lenders? The now out of business AMCs? Who? Who do appraisers turn to when the AMC goes out of business owing them money? Many states, but not all, require a surety bond in order for an AMC to do business in that state. However, as was the case in NC, the bond amount was only $25,000 and appraiser claims exceeded the amount in 4 days, leaving most appraisers to be paid on a prorated basis. So who else is responsible? Maybe you the borrower? Do we really know? The laws are so vague it’s actually quite disturbing. So let’s start with a good story. A story of a lender named Sierra Pacific out of CA that has been bombarded with requests from appraisers to pay fees owed due to the now defunct Coester VMS appraisal management company. Sierra Pacific was the lender using Coester VMS as their AMC. When Coester decided to close its doors, and left appraisers unpaid, Sierra Pacific stood tall, and has since been doing the right thing. They are paying appraisers for work done for them even though Coester VMS took the appraisal money from borrowers and ran. They have stepped up to pay appraisers for fees owed to them for prior appraisals. So bravo to you Sierra Pacific! We thank you for doing the right thing. See the letter below and know that Sierra Pacific is a quality Company. Now we get to Planet Home Lending. So what does this all mean??? You have one lender paying appraisers due to their admission they used a deadbeat AMC to represent them, and want to do what is right. Yet another flat out states they don’t care, nor will they pay, due to not having an agreement with the appraiser directly. Here is the ultimate question? Who is responsible? Is the lender doing the loan or the AMC representing the lender responsible? Does it matter if the lender collects the fee for the appraisal from the borrower and passes it along to their agent to pay the appraiser or if the agent or AMC charges the borrower the fee directly? Good question. Why? Because this is the only profession and industry where there is a third party making contracts, taking payments on behalf of others, and making decisions with your bank or lender, while the actual entity that performs the service is left out. So another question? Why are AMCs taking payments directly from the borrower? What about escrow accounts like Realtors have to use? How about the borrower pays the appraiser directly? We are in a day and age where borrowers can pay the appraiser directly via numerous avenues due to technology, apps on devices, PayPal, credit cards or yes even cash or check. Why for the nth time do we have to have appraisers go unpaid for services due to an AMC failure? WHO MADE THESE TERRIBLE AND RIDICULOUS LAWS? You guessed it. Our government, who is indifferent to small businesses, the backbone of the economy, but they sure will support the banks and lenders. Enough is enough and as consumers you should be outraged as well. You could one day wake up with a lien on your home. Maybe a lien on an investment property? Maybe you just get calls from the appraiser who wants his payment. Are you ready for all of that? Your money is not going where it should but instead enriching the lives of others at the expense of real estate appraisers and small business owners due to these poor laws, legislations and the blind eyes not paying attention. It’s time for a change. It’s time to have lenders pay AMCs separately from the appraiser . It’s time for TRANSPARENCY and ACCOUNTABILITY! It’s time for appraisers to be paid fairly, rightfully and on time. It’s time to change the poor laws. Good article Mark! How about we start a blacklist/deadbeat list and name the lenders and amcs appraisers should stay away from? Good article. I remember when ES went under, appraisers got together for a class action suit against J.P. Morgan Chase who the majority of the work was done for, the judge in Florida threw the case out. Can’t help wondering how much stock he had in Chase. Nice to see at least one lender with integrity. There’s gonna be ALOT more AMC failures in the upcoming months. Appraisal waivers/Threshold are gonna ultimately wipe them out. Bet a privatized FNMA merges with Quicken Loans and/or buys out CoreLogic. Just amazing. On these blogs there’s always at least one guy who nails it! Makes it worth reading the thing. Mr. SB you see the whole picture, and it ain’t pretty. The operative word in all this is: CONTROL. Control of your work product, control of your industry, control of the voter, control of everything including YOU. I’m sure SB, you understand most appraisers are naturally interested in the short game which yields immediate reward, not the long game where, following Mr. Keynes, we are all dead. Except the long game may be approaching faster than you and I can imagine! You sense that? USPAP was chewed over and spit out round about 1990. It was a Romulan Cloaking Device, set up by our superiors (Banks, AI, Gov’t) to take control. Back about 1994-6 I’m ambling along with one of the most powerful atty’s in the City. My client, we had just won a case w/IRS where he had got himself in hot water. As we walked he suddenly stopped, told me: Merv, ya know you guys are done, right? Huh? What’s the problem Bob? Well, the gov’t and banks have taken over the appraisal profession, you people are finished. Awww, Bob, it can’t be that bad. SB, I came back to the office, all the guys working like champs, and suddenly my brother Jer (IQ 191) comes in and tells me privately: Merv, the gov’t, the banks and USPAP have taken control of the biz, I’m outta here, come on w/me and just concentrate on listing/selling. He was a successful commercial broker. 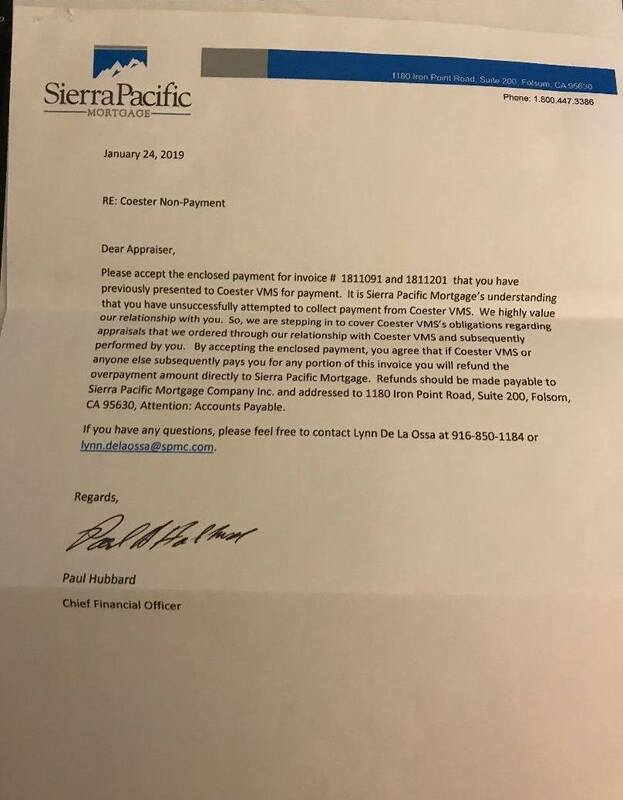 If Borrowers paid Sierra Pacific for their Appraisal and Sierra then paid Brian Coester And he didn’t pay the Appraisers – Brian screwed 3 separate entities. If so, rather than just let him walk away THEY should go after him for theft of service – with a vengence that takes no quarter. Go to Brian Coesters Facebook page and look at all the wonderful ways he has been spending the appraisers money. He is quite the guy. The deadbeats are all the appraisers who accepted the Clients, AMC, etc engagement, without clarification. Some where around the 1990s the AIREA sent out a speaker to speak about protecting your self with an engagement letter and identifying your client. Client identity is a clear requirement of all contracts, including a requirement of USPAP. The states require contractors to pass tests in contract law and lien law for their license. Fraud, deceit, fear and laziness share a blame in client collections. Anyone else had trouble with AMC – Norman Hubbard to pay or with revisions? I don’t know, I fired NH after one order. Why would anyone work with any what’s your fee and turn time to infinity types? Mental note, never taken an order from Planet Lending because they obviously view appraisers as disposable heroes. You saw this coming oh so clearly down the tracks for years now. Why complain about getting hit by a train when you could have engaged in simple direct lender to appraiser marketing and simply stepped off the tracks. Lenders whom use amc’s have not earned any compliments, quite the opposite in fact. I had a dream of appraiser independence, but ya’ll keep messing it up. Capturing lead positions on direct panels is as easy as never mentioning cod. I appreciate billing and personally do not like cod, because every time I then have to explain the complex nature of who owns the report and such. It’s easier to just sidestep that conversation completely. I’ve only had like one instance of non payment for lender direct in well over a decade, but used to deal with that routinely with a variety of amc’s. It was always random, like their quality of service. More closures are on the way. Remember when the BC used to post here, under pseudo names? Those were funny posts when the administrators caught him. ‘Why are you guys always picking on Brian?’ Some lady showed up to question the rhetoric. Well, geesh, when amc companies sprang up like weeds and severely compromised appraiser independence as we know it on a national scale, appraisers were forced to either slow down significantly or adopt wreckless automated and outsourced behaviors. Did they expect us to be nice, and comply with the purposeful dismantling of our own industry? What’s up with the 100% forum? It would be nice to see more regular participation there. Cheers. 100% don’t do the fb. The 100% real estate appraisers forum is up and running. I’m working with a tech company to fine tune it and get it more enhanced. We even have a interactive chat room. Give me a some time and it will be even better. Right now you can find it at https://100reappraisersforums.createaforum.com. The url will change soon after i get the expert help i need. Looks pretty cool so far. Are you able to source a nifty game there like typershark or something? I’ve registered there as Sim Theory. Yes, great choices, digi-security first. Thank you. When you have it up and running, post the link for us. Good to see appraisers getting involved. Anyone have some dirt on Norman Hubbard AMC? why do you ask? are they in financial trouble as well? I do occasional work for them and currently pay on time. Something BIG is brewing folks. Take a look at FNMA stock price since January 1. Take a look at Core Logic stock price since January 1. Ellie Mae was acquired this week. DON’T BELIEVE THE LIES….MORTGAGE RATES ARE NOT GOING UP THIS YEAR. Corelogic is buying out everything……..Monopoly in the works???? At least they pay on time. But they do take a big cut of the fee. They have appraisers really undercutting each other to get work. Wonder who did the valuations. Guarantee she’s not the only one who did this. Always wondered how so many REOs were assigned in mass quantities to the lowest life agents imaginable. Agents you have never heard of would literally get 100s of listings. These agents are long gone today. How are appraisers still accepting orders from Clear Capital? I’m on their list just to see what they offer and just received one on a 2055 for $200 (ignored it) on a property that closed 6 months ago @ $600,000. I’ll bet that lender paid them at least $450 for the order. Man while your doing two for them I’m doing one 2055 for $50 less than the two you just took from them suckers. WAKE UP! If appraisers didn’t take their business they would not be in business. Add Norman Hubbard to the list. Oh crap, I just took a job from them because they agreed to my fee. Haven’t done it yet because seller hasn’t been available. Every day I get a request for update when I have already told them the tentative inspection date. Getting to be real annoying. Hope I don’t regret taking the order. They don’t pay if they don’t get what they want. I’d cancel them if I were you. They never scope the job correctly. The same thing happened to me. They went for the fee and then never paid. Dave, I did cancel the order, owner kept putting it off, then I checked the crime rate in that section of Waterbury it was 78%. No thank you, I’m too old to carry a gun, or put up with any crap. Now I know why they agreed to my fee. Thanks for getting back to me. Norman Hubbard operates like Coester. We have to get the word out! We were affected by Coester. 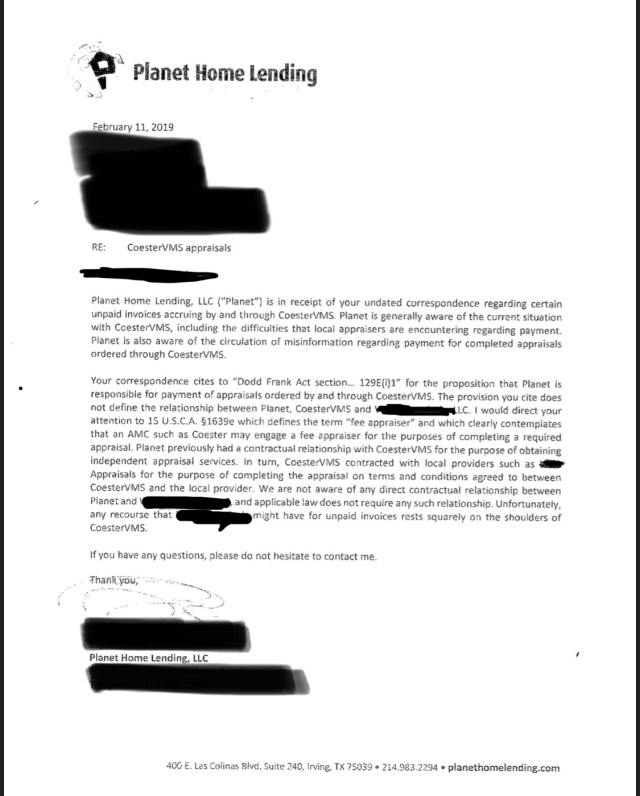 This AMC was in the practice of printing the payments and then holding them until the appraiser/office manager called frequently and threatened with a lawyer. Yes, I had to do that. I started last May 2018 trying to get the $8500 we were owed. I got 6 checks at a time. Each time they said they were sent and sent me the dates and check numbers. I had to explain that we never received said checks. Each time after months of calling and they finally sent a few…low and behold they were the exact check numbers and dates originally stated. So these AMC’s get part of our fee and they are not doing the job. I would like to get hired directly from the lender and paid from the lender. But then there is the good old lender fraud that appraisers were supposed to be protected from. Holy cow!!!!! Will the deceit ever end? We just want to do a good honest job and get at the end of the day. I did turn Coester in to licensing for Idaho and Washington. Next story Standing With Us Protecting Consumers! Previous story Another Draft to a USPAP Draft! AGA Standing With Us Protecting Consumers! Appraisal Another Draft to a USPAP Draft!